Now the soundtrack details have arrived and they, too, look pretty good. As we already know, Michael Andrews composed the score and he’ll always be in our good books for writing the fantastic, dreamy music to Miranda July‘s debut, “Me and You and Everyone We Know.” He’s fallen in with the Apatow crowd of late, having scored “Walk Hard: The Dewey Cox Story” and “Funny People” (which Jason Schwartzman partly scored as well). Plus, he wrote the music for “Cyrus” (the score was excellent, it’s a bit criminal no disc was released) and he’s also composing the music to “Bad Teacher,” which is just another reason to anticipate that flick. More soundtrack details below. The 13-song disc includes tracks by Playlist faves Fiona Apple and Inara George (George did all the wordless vocals for the Andrews music in the aforementioned July film and she rules on her own too), a cover of the Violent Femmes classic “Blister In the Sun” (by Nouvelle Vague), ’90s faves Hole, two takes on the same Blondie song and some straight up musical irony too (Wilson Phillips). 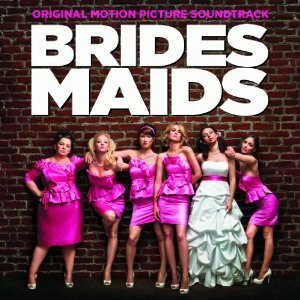 “Bridesmaids” hits theaters May 13. The soundtrack is due on May 10.